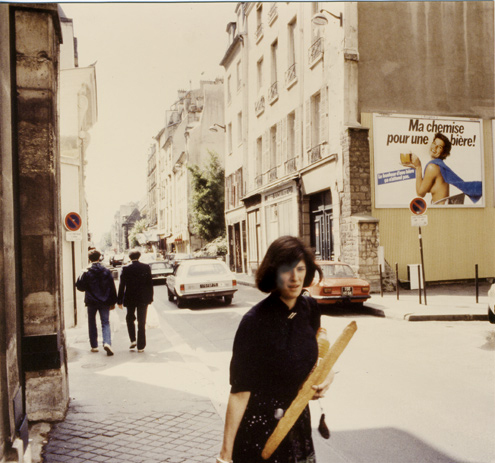 “The sign brings customers,” wrote the French fabulist Jean de La Fontaine (1621-1695), but sometimes signs can make it appear that the merchant has changed her mind. Take this pairing of signs on the door of the Busy Bee in Inverness Park. To be fair, I photographed the signs today when the bakery wasn’t scheduled to be open, but the juxtaposition was still surprising. 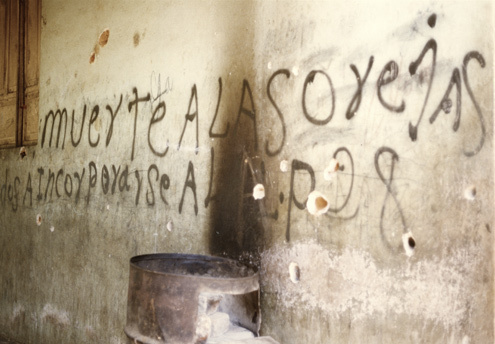 Wartime graffiti can at times be merely sarcastic. 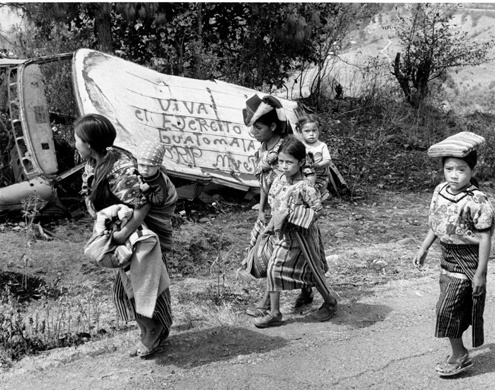 Because of deforestation brought on by trees being felled for heating and cooking, the Guatemalan government three decades ago restricted cutting trees in the wild. 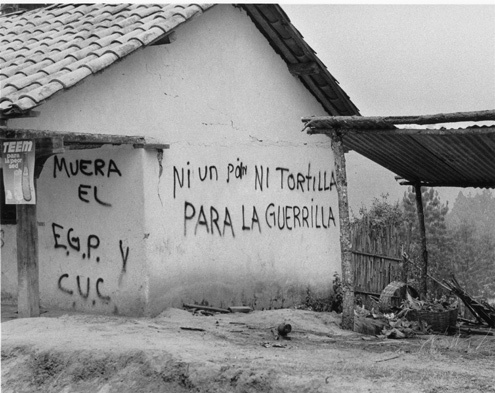 However, guerrillas back then often toppled trees across rural roadways to block traffic. 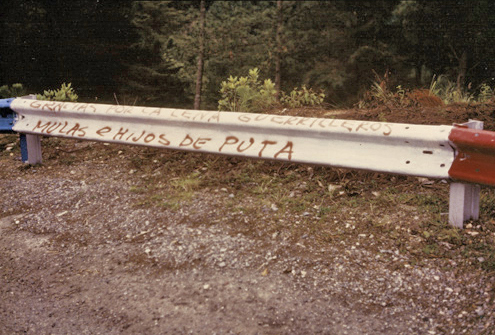 The trees, of course, had to be cut up to reopen the roads, and that prompted this graffiti which, judging from its red-white-and-blue colors, was painted by a member of the far-right National Liberation Movement (MLN). Equally surprising was this scene I came upon a week ago at the entrance to Tilden Regional Parks Botanic Garden in Berkeley. 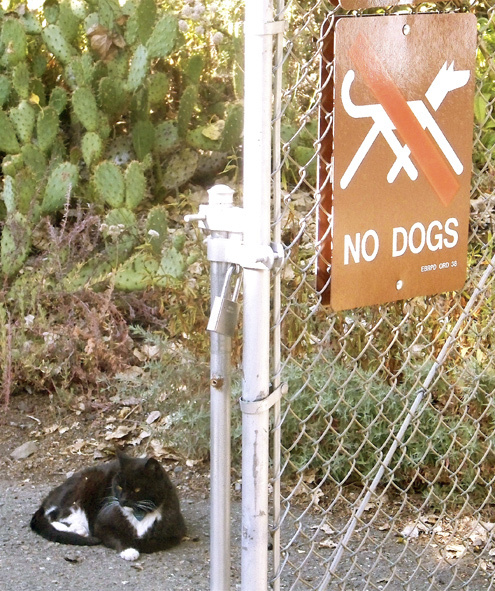 Was this a guard cat or was the cat staying behind the sign so it wouldn’t be disturbed by dogs? I don’t know the answer, but I’m looking for a sign. 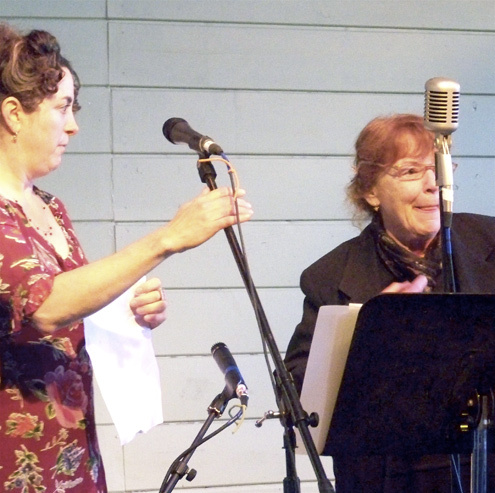 Roughly 200 West Marin residents showed up Sunday evening in Toby’s Feed Barn to honor Duane Irving, who died of a heart attack July 19 at the age of 75. A succession of residents related their memories of Duane for the crowd, and several remarked on his fondness for ice cream. At San Rafael High, Duane was an excellent football and especially baseball player, and after graduation joined the Marine Corps. 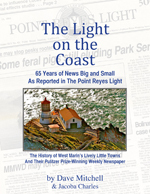 Following four years in the Marines, Duane broke horses for Bud Farley, whose ranch was later flooded by Nicasio Reservoir, and was game manager and cattle boss for Doc Ottenger, whose land would become part of the Point Reyes National Seashore. 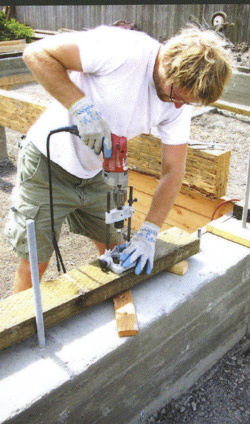 At the request of the late Olema Valley rancher Boyd Stewart, Duane helped establish the Morgan Horse Farm within the National Seashore and subsequently worked in the park’s Roads and Trails Department. Emcee Cindy Goldfield introduces her mother Joyce, Duane’s companion for many years, who paid an emotional tribute to Duane. 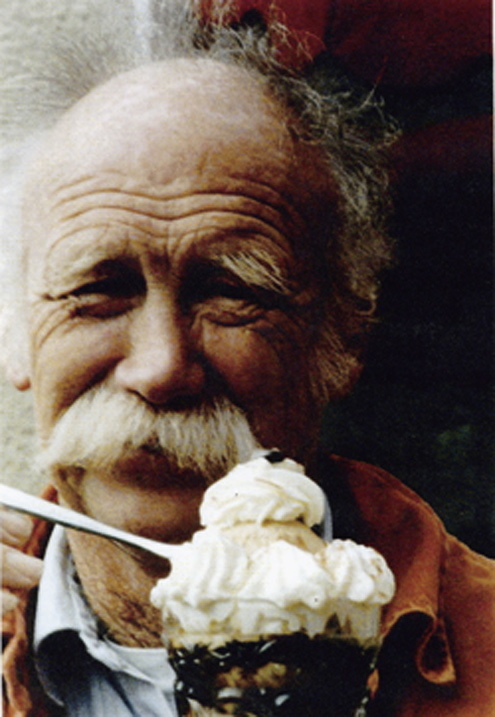 Many West Marin residents knew Duane best for his involvement in Halleck Creek Riding Club. For more than 30 years, he, Joyce Goldfield, and many volunteers helped people with disabilities gain self-confidence and enjoy rugged terrain on horseback. People who had served as volunteers to lead the riders and people who had been riders themselves both told of their appreciation of Duane. 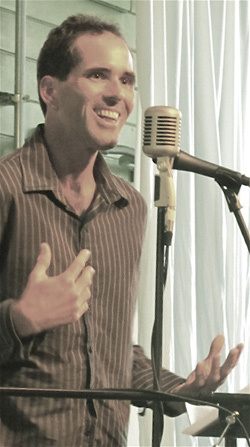 Despite some difficulties with speech and the use of his legs, Xerxes has developed into a first-rate athlete and now teaches tennis, as well as writes poetry. He and Duane had played basketball against each other and held nothing back, including “sharp elbows,” Xerxes said. “Duane didn’t care if you could talk or walk,” Xerxes added. He cared about the person. Perhaps the most-poignant tribute to Duane was offered by a young woman with Down’s Syndrome. With unexpected eloquence, she described how much she valued Duane’s encouragement and support. Then speaking directly to Joyce, she said that Duane still sees her and loves her. By this point, I like many others in the Feed Barn had tears in my eyes. “Oh God, thy sea is so great, and my boat is so small.” — Fisherman’s prayer from France’s Brittany coast. 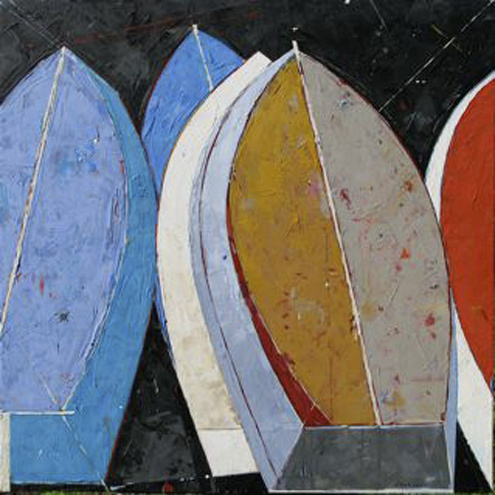 ‘Stacked Boats II,’ 48-by-48 inches, in the I Wolk Gallery. 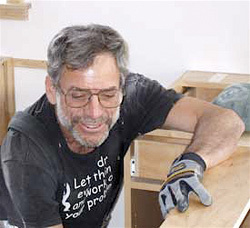 A Point Reyes Station artist who in recent years has managed to survive on small boats is Bruce Lauritzen. In fact, for the past month, exhibitions of his idiosyncratic “Vessel Series” have been featured at two galleries in the Napa Valley. His abstracted representations of boat hulls had been scheduled to come down this Thursday, but the show has now been extended to Sunday. Lauritzen sold a 72-by-36-inch canvas titled Yellow Boat (above) for $12,500 the day the show opened, which was “unexpected for hard times,” the artist acknowledged. More have sold since then. 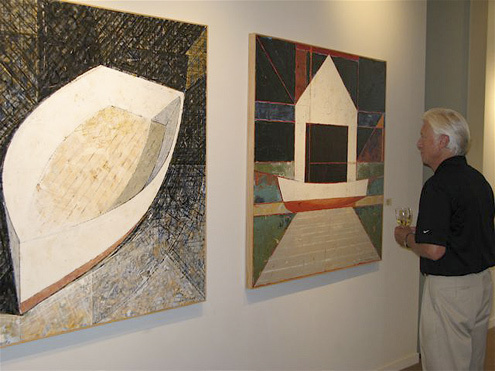 Among the paintings on exhibit are ‘Rembrandt’s Boat,’ 54-by-54 inches, (left) and ‘Boat House,‘ 54-by-54 inches, in the I Wolk Gallery. The show, called “Voyages” is split between two galleries, the I. Wolk in St Helena (Lauritzen’s gallery before Ira Wolk was killed in a bicycle accident) and Ma(i)sonry in Yountville, which is also showcasing a wine line by the new owner, Michael Polenske. 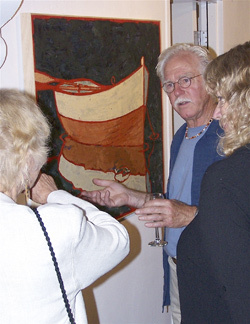 Here the artist is seen at a Marin Museum of Contemporary Art show in June 2008, discussing his painting ‘Still Waters III’ with two guests. 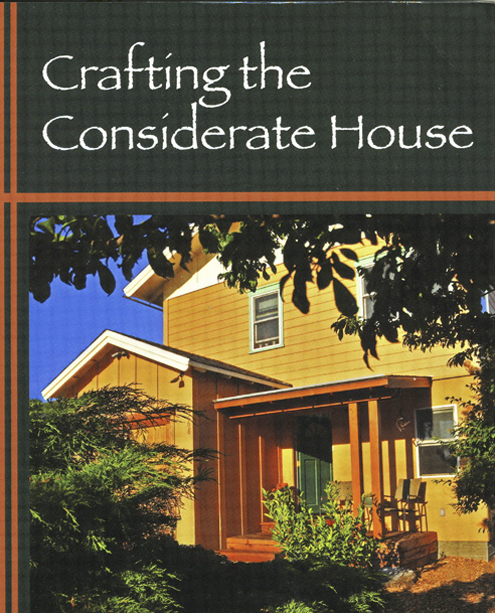 Attending on scholarship, Lauritzen graduated from California College of Arts and Crafts in Oakland. He earned a master of fine arts degree at the San Francisco Art Institute. Lauritzen later taught at the College of Marin and the Academy of Art University in San Francisco. 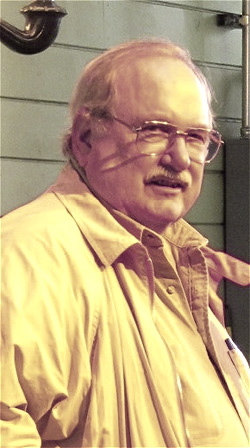 He was also a member of the Marin Arts Council’s founding board of directors. The artist’s work is in more than 100 private, institutional, and museum collections, including the San Francisco Museum of Modern Art and the Achenbach Foundation at the California Palace of the Legion of Honor. 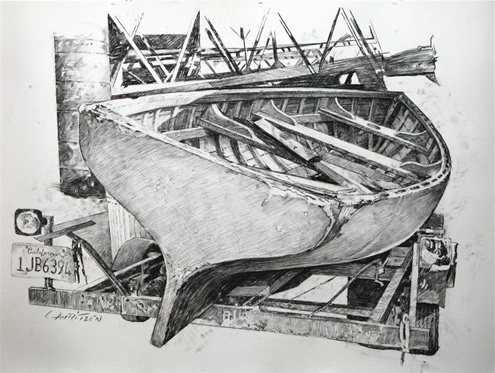 ‘Boat on Trailer,’ 44-by-61 inches, I Wolk Gallery. 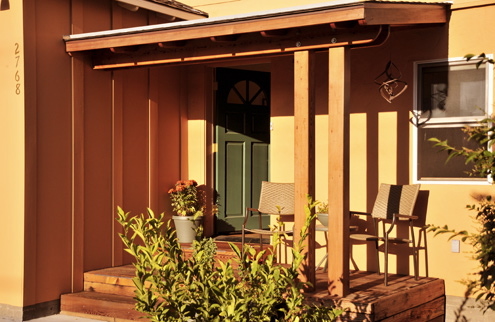 I. Wolk Gallery is located at 1354 Main St. in St. Helena, and Ma(i)sonry Gallery is located at 6711 Washington St. in Yountville. Those planning to see Lauritzen’s large paintings of small boats need to call ahead (707 944-0889). Shortly before noon Wednesday, I received a call from Linda Sturdivant who was looking off her deck in Inverness Park. “I see smoke!” were the first words out of her mouth. A column of smoke was rising in the vicinity of Black Mountain, she said. Immediately I hopped into my car and headed that way, but as soon as I turned off Highway 1 and onto the Point Reyes-Petaluma Road there was a sign saying: “Novato Fire District Training Exercise.” So there was nothing to worry about, but I continued on to Platform Bridge so I could photograph a controlled burn smokey enough to cause concern on the far side of Tomales Bay. 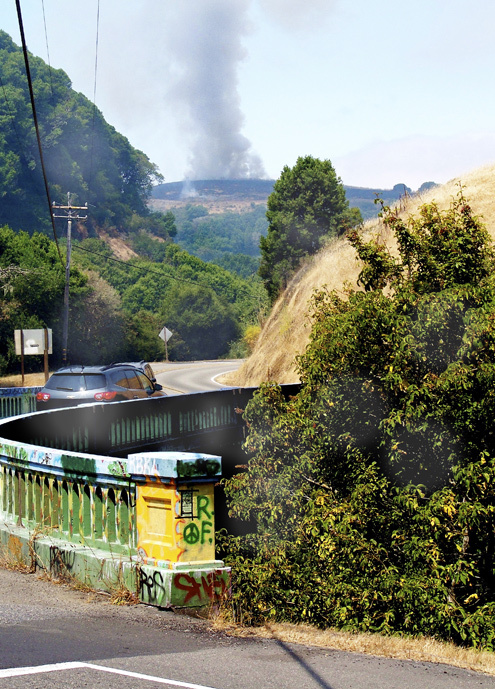 Update: Although roadsigns signs said the controlled burn was a “Novato Fire District Training Exercise,” the Marin County Fire Department — while the fire was underway — issued a press release that said the fire was “to provide a training opportunity for Marin County Fire Department personnel.” Go figure. The county press release also said the fire was intended “to remove the non-native, invasive vegetation in the area.” The press release added that the burning would continue on Thursday, which it did. 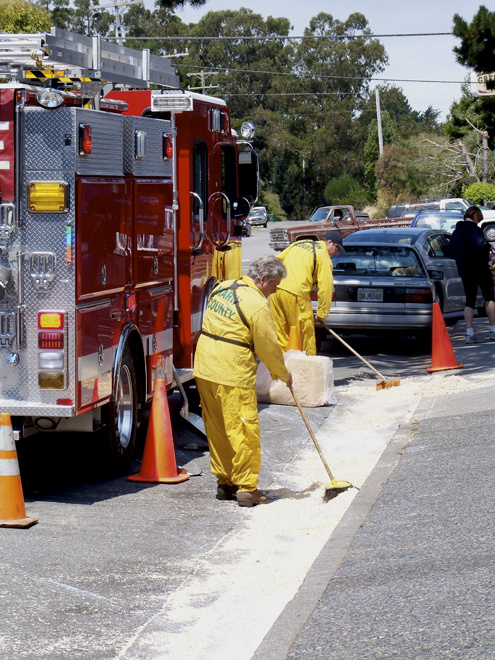 I then returned to town only to find Marin County Firefighters in action on the main street. The firefighters had been dispatched around noon to clean up a paint spill in front the Palace Market. One firefighter said he’d heard of small amounts of the white paint having been spilled from Inverness to Point Reyes Station. The top of a paint can was found in a trash receptacle at the market. The fireman said that none of the paint, which was mostly in the gutter and the entrance to the Palace Market parking lot, got into the storm drain. However, he added, the cleanup (in which absorbent particles were used to sop up the paint) was necessary to keep cars from getting paint splattered on them. Do you like coyotes and bobcats? How about rats? Coyotes began howling not far from my cabin just before dark tonight. For me it’s a thrill to hear and occasionally see them, but I’m no sheepman. 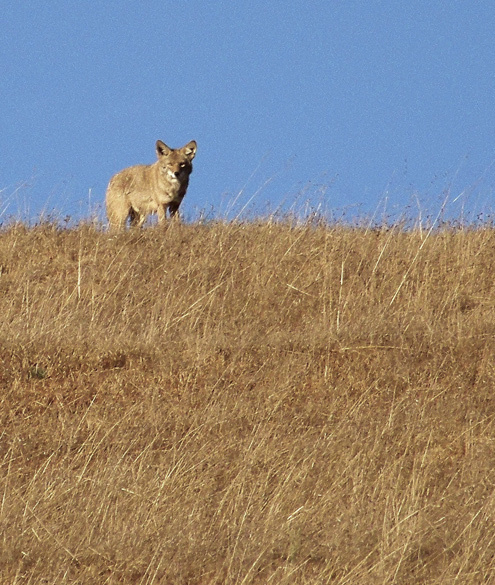 For 40 years, there were no coyotes in West Marin because of poisoning by sheep ranchers. However, coyotes never disappeared from northern Sonoma County, and after the federal government banned the poisoning, they spread south and began showing up here again in 1983. Since then coyotes have put more than half the sheep ranches in West Marin and southern Sonoma County out of business. 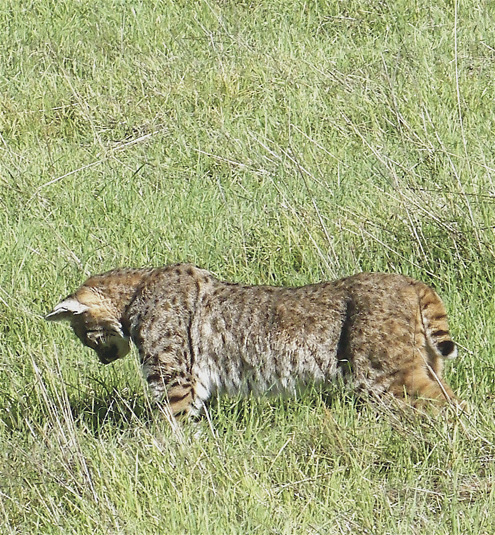 There are also more bobcats around these days, and some Point Reyes Station residents believe that many of them had been living in the pasture of the Giacomini dairy ranch before the Park Service bought the land and in 2007 flooded it. For residents raising chickens or other fowl, the forced relocation of bobcats has been a serious problem, and a number of them have been shot. But for the rest of us, spotting bobcats is exciting. I occasionally see them around my cabin, and for the second time in a year, nature photographer Sue Van Der Wal of Inverness saw a bobcat at her house on July 23, as she told me with delight. Also intrigued by bobcats is professor Michael Scriven of Inverness Park. Michael, who has taught at universities in the US and abroad, as well as written numerous books and articles, last month penned a light-hearted “memento of a recent visitor” and sent it to me. 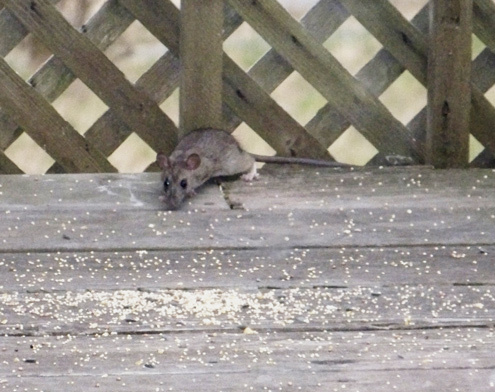 A roof rat eating birdseed off my deck last week. 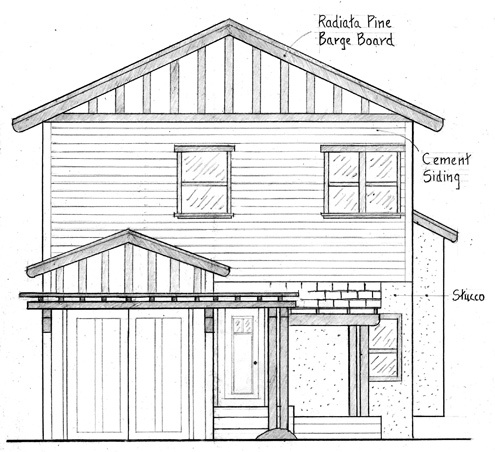 I enjoy watching roof rats but had to spend time and money last year cleaning their droppings out of my basement, sealing off walls they had chewed through, and repairing an electrical line on which they’d been gnawing. Roof rats are also plentiful at the moment. In June, I found one that had been run over on block-long Campolindo Road — not exactly a high-speed thoroughfare. And during a dinner party in Stinson Beach last month, I spotted a roof rat at a neighboring house scurrying across (appropriately enough) the roof. Some people have nothing good to say about roof rats. Along with getting into basements and attics, they are especially fond of chewing through the drain hoses of dishwashers. In addition, many people are aware of the roof rat’s role in the Black Plague. In the 1340s, their fleas spread the plague around Europe, killing off half the population in some places. Roof rats originated in tropical Asia and made it across the Near East in Roman times before reaching Europe by the 6th century AD. As the influence of European countries spread around the world, so did roof rats, arriving in the New World on the ships of European explorers. Not surprisingly, another name for roof rats is ship rats. 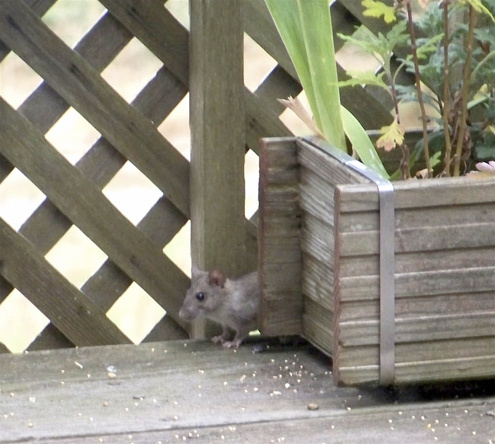 Roof rats are smaller than the inaccurately named Norwegian rats, which are actually from North China. 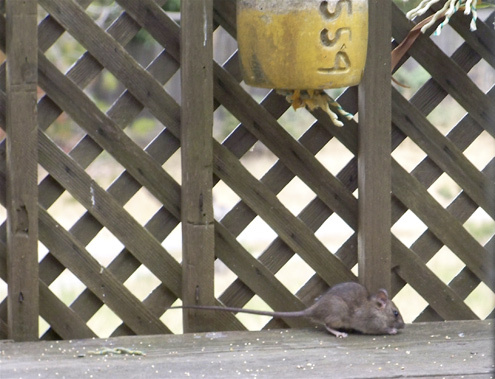 An easy way to tell the two apart is that the tails of roof rats are longer than their bodies. The tails of Norwegian rats (also called sewer rats) are not. All this raises the question: is there anything good that can be said about rats other than that they’re cute — at least to some of us. Apparently there is. The 2006 Children’s Choices Award went to a book by Barbara Wersba about a rat named Walter. I haven’t read Walter, but Publishers Weekly reports: “Wersba’s brief tale of a blossoming friendship introduces a literate rat, who ‘christen[ed] himself Walter’ after reading works by Sir Walter Scott and [by] the children’s book author whose home he inhabits. “The rat hero, who lives under the floorboards of a house owned by Miss Pomeroy, makes a discovery in her library one day. Not only has she written a children’s book series about a secret-agent mouse, but he discovers many other authors who have also written about mice (‘There was a whole flock of little books by a woman named Potter, which dealt obsessively with mice,’ he observes disdainfully)…. Somewhat surprising for a children’s book are Walter’s reported allusions to The Great Gatsby, A Farewell to Arms, and The Maltese Falcon. These “will appeal more to older readers,” Publishers Weekly wryly observes. 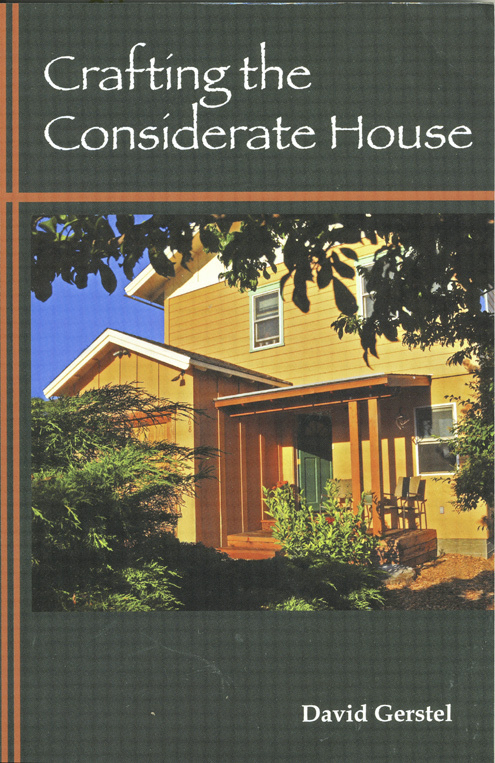 Walter is appropriate for readers 8 and up, the review says. So if you’re 8 or older or have a child that is, you may want to pick up a copy of the book in order to keep rats in perspective. 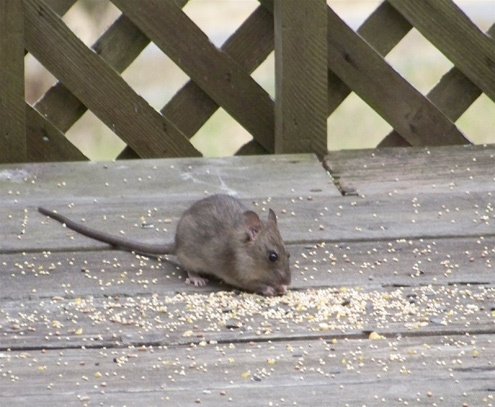 In the course of their lives, most people encounter far more rats than bobcats or coyotes. Sparsely Sage and Timely is powered by	WordPress 4.9.10 and delivered to you in 1.122 seconds using 57 queries.